Submissions for the 22nd East Lansing Film Festival are now open! The Early-Bird deadline is March 31st. Submit before then for discounted submission fees. Please read and follow the Entry Regulations carefully. Submission will not be considered unless accompanied by appropriate fee, completed FilmFreeway online entry form, and a 25-35 word summary. Press and publicity materials are appreciated but only required after being accepted into festival. All entries must be in English or contain English subtitles. If your film is selected for festival screening, you must supply 300dpi resolution color stills (not of the production but from the film itself). We also require as much publicity material that is available. If your film is selected for festival screening, you must supply a Digital copy and a Blu-Ray copy of your film. The festival director must authorize exceptions to the festival regulations. The entrant must pay the cost of shipping an entry print to the festival. Collect or COD shipments will not be accepted. All international entries must be sent “free domicile” to the Festival Office with all transportation charges, duties, and taxes prepaid by the shipper. Any brokerage fees charged to the East Lansing Film Festival will be billed back to the shipper. Be sure to include all the proper customs documentation required by your shipping service. Entries must not have been previously submitted to the East Lansing Film Festival. Entries must be in English or subtitled in English. Films or videos of any length (feature, short), style or genre (narrative, documentary, animation, etc.) are accepted (see appropriate category). If selected for screening, the filmmaker will be contacted by email by September 15, 2017. Exhibition 35mm prints, Blu-Rays, DVDs and digital files must be received at least 14 days prior to the festival start date or a screening copy will be used. Submissions received without the proper entry fee WILL NOT be considered for entry in the ELFF and will not be returned. Directed by Rina Castelnuovo and Tamir Elterman, 2017. For seven years Muhi, a brave and spirited boy from Gaza, has been living in Tel Hashomer, an Israeli hospital, the only home he has ever known. 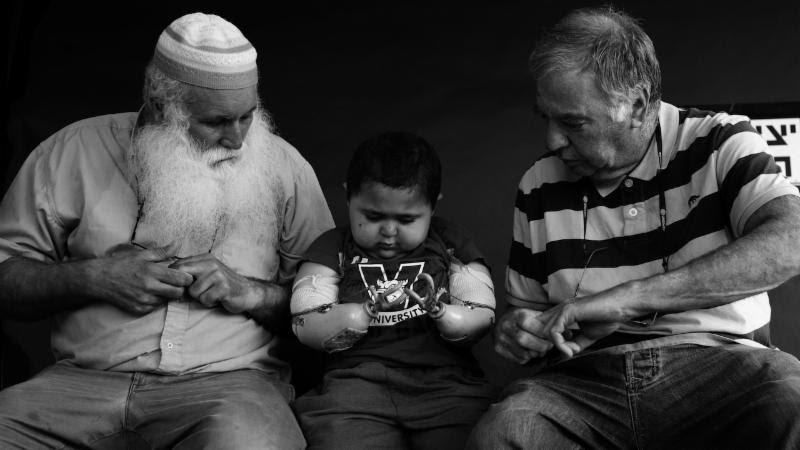 Caught between two homes and two peoples, he is raised by Israeli volunteers in the hospital and his grandfather. His time at the hospital is running out and Muhi now faces the most critical choices of his life. DocAviv Film Festival, Best Documentary of 2017. Golden Kapok Award, Best Documentary Director 2017, Guangzhou Documentary Film Festival, China, Documentary Film Festival, China. Professor Yael Aronoff will introduce the film and lead the discussion afterwards. Chicago Festival of Israeli Cinema, Israeli Film Festival New York, Miami Jewish Film Festival. Ellen Rothfeld will introduce the film and lead the discussion afterwards. transplant committee objects, claiming that Reuben, Gad’s sole legal guardian, has a conflict of interest. In Hebrew with English subtitles. Winner, Audience Choice Award for Best Feature Film, Israel Film Festival in Los Angeles 2018.Nominated for 8 Ophir Awards (Israel’s Academy Awards) including Best Picture of the Year. introduce the film and lead the discussion afterwards. The year is 1983 and Yaakov Cohen, the owner of a Jerusalem printing press, is tired from being pushed around. It seems that he was born on the wrong side, with the wrong family name and in a moment’s decision he decides to establish a Sephardic-ultra-Orthodox list that will run to the Jerusalem municipality. He gathers two friends, and together they improvise a campaign – no means, no connections, no money, but with much rage, passion and a sense of justice.In Hebrew and Yiddish with English subtitles. Professor Ronen Steinberg will introduce the film and lead discussions afterward. The 21th East Lansing Film Festival takes place November 1 - 8, 2018 in East Lansing and Okemos. The Indie Film Series has moved to Celebration! Cinema, South Lansing and will show 4 independent films over a 4-week period from May through August. IFS returns to Studio C! in September. Test your filmmaking skills in the 48/5 Film Contest where teams must make a 5-minute film in just 48 hours. Cash prizes are given to the best films.